In honor of the 50th Anniversary of the end of Mainline passenger as well as electric service on the Illinois Terminal (IT), this year's meet of the Illinois Traction Society will be held on Saturday, April 29, 2006 on the Illinois Railway Museum (IRM) grounds, 7000 Olson Road, Union, Illinois, (815) 923-4391. Motorman Bob Heinlein will be your host for another memorable meet at this truly unique IT site. There will be a $15.00 charge for the clinics, tours, train rides and evening slide program. The cost of dinner is $10.00. Registration will begin at 9 AM, at the East Union Depot. IT 101 inaugurated the IRM 2006 operating season on April 2nd, its first day carrying passengers in over 15 years. The annual "Interchange" (Swap Meet) will be held from 10 AM to 4 PM at the trolley bus barn. A trolley bus will operate a shuttle service along Central Avenue to the bus barn; running every 15 minutes. The Eighteenth Annual Modeling Contest will be held in the Reception Room of the Diner at the corner of Depot Street and Central Avenue, so be sure to bring your "prize" model to enter. Entry forms will be at the registration desk and categories are Electric Passenger and Freight Motors, Diesel, Freight Cars/Miscellaneous Equipment, Cabooses, Structures/Dioramas and Photographs. Ribbons will be awarded for First, Second and Third place showings. Hourly mainline operations from East Union will begin at 10 AM and continue until the last train lays up at 5 PM. 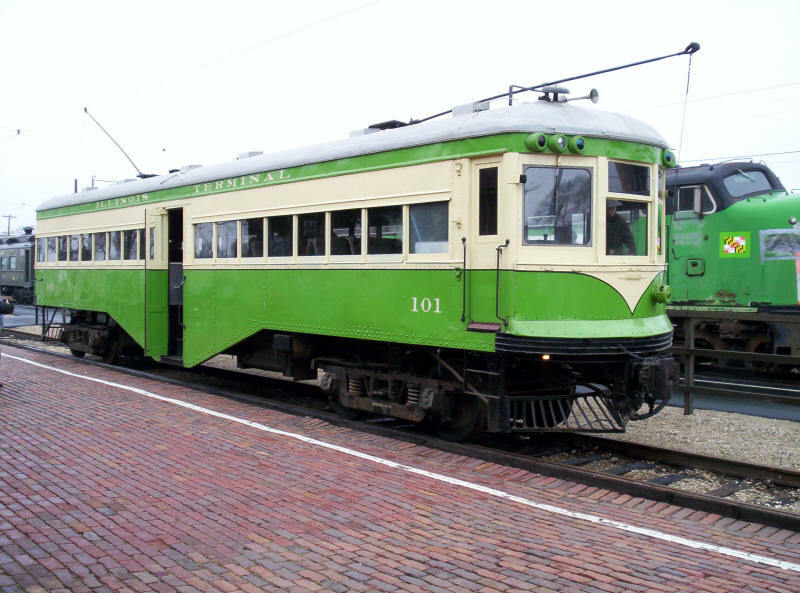 The Streetcar Loop will also operate from 10 to 5 with a car every 20 minutes making stops near the depot, the Trolley Bus garage, Barn 9 (steam and big electric locomotives) and the Diner for clinics and lunch. Carrying white flags a photographer's train will depart from East Union at 9:45 AM to unload at Seeman Road and take the siding for a meet under the catenary with the first scheduled train. Freight train run-bys near the depot will feature GP-7 diesel power (1605) at 1:40 PM and the Class "B" (1565) at 3:45 PM. Attentively the passenger fleet will include St. Louis & Alton 101, Bridge Car 415 and trailer 518. Motive power will include Class "B: 1565 and GP-7 1605. In the event of severe weather other equipment may have to be substituted for riding guests. Wherever possible, other IT equipment will be located at barn doors and weather permitting; will be moved outdoors for viewing. The agenda of clinics include the "Illini Trail" at 11:15 AM in the Diner, "Metamorphosis of Car 415" at 1 PM near the Central Avenue trolley shelter, a tour of cars 233 and 234 at 2 PM East of Barn 6, and a walk-thru tour of the Electric Car Shop at 2:45 PM. Additionally, the Tower at trackside will remain open for four hours starting at Noon so visitors may observe CTC controls in use. Starting 5 PM dinner will be served at the St. John Lutheran Church in Union, which holds its well renowned once-a-year evening barbecue. The meal consists of one-pork chop, a chicken quarter, applesauce, potato salad, Cole Slaw, baked beans, desert, and soft drinks. Dinner will be held in the church gymnasium between 5 PM and 7 PM. At 7 PM, the Annual Meeting will be held in the church's Choir Room where a short "State of Society" report and awarding of contest ribbons will be made followed by a slide show by Bob Bruneau and Bob Heinlein entitled' The Main Line; Route of the Streamliners". The cost for the society's event and evening dinner is only $25.00. 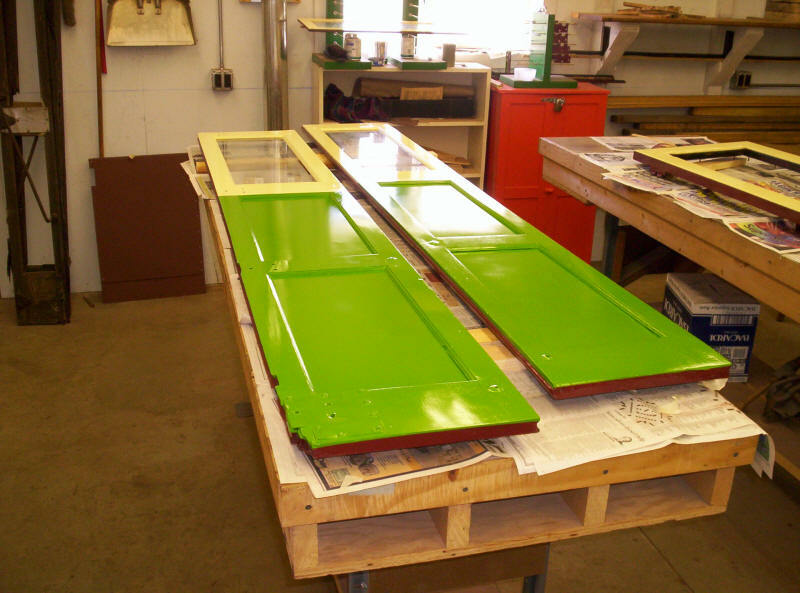 This photo shows, on Sunday April 9th, a pair of doors� for IT 101 that were removed from the car in the 1970's; they have been in storage since, and are now finally being finished, painted and mounted on the car. All photos by Frank Hicks. 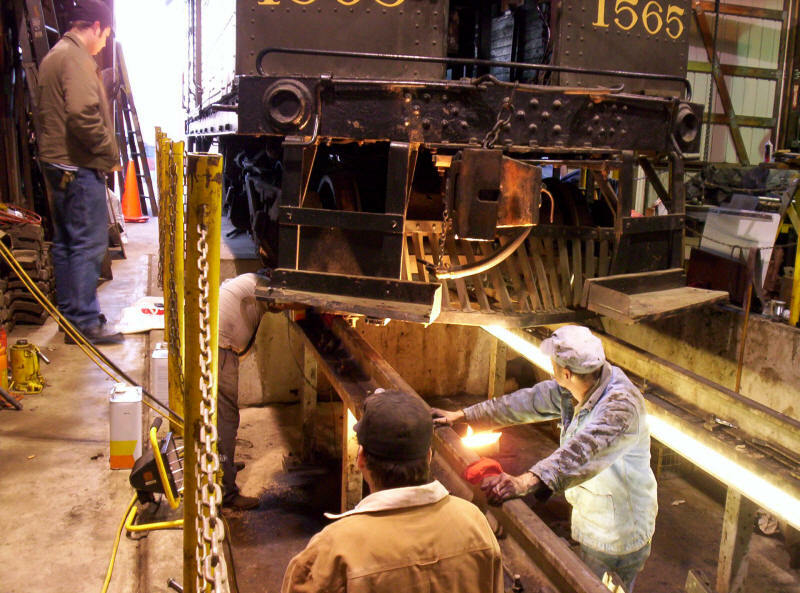 The Electric Car, Freight Car, and Diesel departments of the Illinois Railway Museum have been doing a significant amount of work to a number of Illinois Terminal pieces in order to make them ready for operations or viewing for this meet. 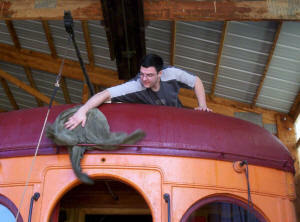 On Satruday, April 15th, IRM volunteer Charlie Strong washes down the roof of IT coach trailer 518, which will be carrying passengers for the first time in around 15 years. 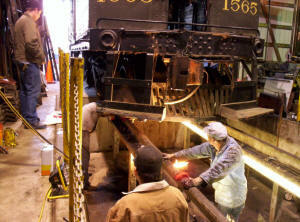 Also on Sunday April 9th, IRM volunteers work on cleaning the motors on Class B electric locomotive 1565. 988 (bay-window caboose) - mechanical inspection for use on demonstration freight train Various freight cars - inspected for use on demonstration freight train. The Illinois Railway Musuem's website has a complete roster of equipment.